Difficulty: Tracks range from easy to extreme. Carrington Falls is a 5 star scenic spot and has a little something for everybody. If your after a relaxing walk with the kids the 1km circuit at the Carrington Falls Picnic area (also known as Thomas Place) is ideal. The circuit includes lookouts over the Carrington gorge and an amazing view of Carrington Falls. You will not be disappointed. This is a great spot for a picnic. On the other side of Carrington falls is Nellies Glen. Just a short work from the car park takes you to a beautiful waterhole with a small waterfall. Great place to have a dip. For those that want a bit more exercise there are a few bushwalks to choose from. On the Carrington Falls picnic area side there is Stevo’s track which is about 4km return. Nice little trail. On the way there is also Lizards lookout which is worth a look. On the Nellies Glen side there is the Missingham Steps trail. This leads to 2 incredible lookouts. For those a bit more adventurous you can also head down the gully and investigate Missingham Steps. This is extremely scenic and takes you through lush forest. However it is hard so only tackle it if your fit and can do a bit of climbing. Now for the extreme hikers. There is a 15km Carrington Falls circuit. However this should only be attempted by experienced hikers. 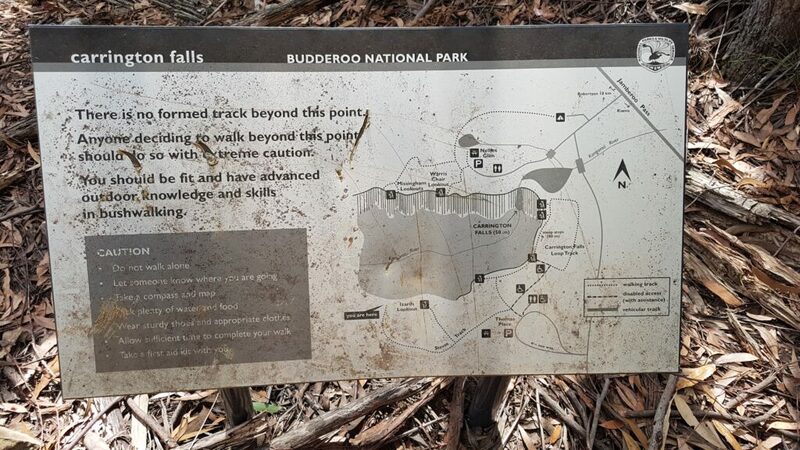 There are warning signs put up by the National Parks warning bushwalkers how hard this trail is. At the end of Stevo’s track take the rut towards the gorge. You’ll come across a warning sign about the adventure your about to take. I haven’t done this yet but have read you make your way down to Kangaroo River. The blogs state this is NOT an easy challenge and the track is easy to loose. So be prepared with maps or a GPX map. Once at the bottom of Kangaroo River make your way up to Missingham Steps and rejoin the common track. If anyone knows a way to get to the bottom of Carrington Falls could you let me know. I wouldn’t mind getting down there. Highly recommend Carrington Falls. Get down there and check it out. The waterfall is close to Robertson Pie shop. Worth getting there for some lunch on the way back. They do a great pie. Directions to Carrington Falls trail head. Google Map Link. On Jamberoo Mountain Rd at the top of the escapement there is a sign letting you know the turn off to Carrington Falls. Take the turn. The site is well sign posted letting you know where to go. Carrington Falls Hike Trail Map. Distance: Various distances. 1km to 15km. Difficult: Suits all levels. Tracks range from easy to extreme. Carrington Falls Hike Trail Map of Missingham Steps. 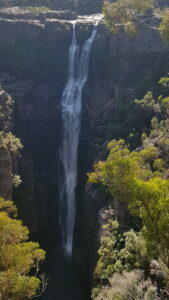 Carrington Falls Bushwalk Photo Gallery. Directions to Carrington waterfall trail head.